In October I was a recipient of the Mary Kay Clear Proof VoxBox from Influenster. They sent me this VoxBox to test the Clear Proof products. In this post, I'll be sharing my thoughts and opinions on the products I received. This is my second VoxBox and I have to say Influenster doesn't disappoint. The products I've received in both boxes were full size or close to and they aren't cheap products. What is the Clear Proof VoxBox? The Clear Proof VoxBox contains the Clear Proof Acne System by Mary Kay. This system is a four-step regimen that is formulated to clear blemishes without irritation and fade the look of lingering acne spots. You can purchase the system for $45 or each product separately. 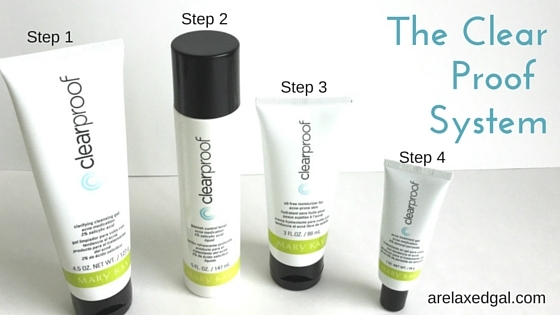 Step 1: Clarifying Cleansing Gel which contains 2% salicylic acid. This gel cleaned my skin but didn't leave it feeling dry. I really like the way it foams and how a little bit goes a long way. I think this tube will last me a while. Step 2: Blemish Control Toner which also contains 2% salicylic acid. As it says in the description it removes excess oil without overdrying. After I used the toner my skin didn't feel dry a feeling I've gotten from other toners and I know it removed anything left over from the gel based on the color of the cotton ball afterward. Step 3: Acne Treatment Gel that contains 5% benzoyl peroxide. I used it on the most prominent spots that I had. It didn't have a drying effect on those spots and I did see a shrinking of the spots within a few days of the first use. Step 4: Oil-Free Moisturizer for Acne-Prone Skin. The moisturizer is runny so I've been holding it upside down when opening it otherwise I end up wasting some. I like that the moisturizer doesn't leave my skin feeling and looking oily which is a problem I sometimes have, even with supposedly oil-free moisturizers. I have used Mary Kay Clear Proof System once a day for seven days and none of the products created any abnormal dryness. I saw the few pimples I had clear up within a few days of my first use. This system also seems to be helping in minimizing a dark spot left over from a pimple on my left cheek. None of the products have an unpleasant smell. And you don't need to use a lot to get results. I can't say that I would purchase the whole system. The only reason is my acne isn't bad enough where I feel I need to consistently use something so strong on a daily basis. I did really like the cleanser and acne treatment gel so I can see myself purchasing them on their own. If you have a consistent acne problem and are looking for products to use, this could be something to try out.